When you think about high-stakes gambling, the pokies probably isn’t the first thing that comes to mind. However, modern online casinos now offer a bevy of top-shelf slot games which cater for the really big spenders among us. Here, we’ll show you a few of our favourite VIP pokies from some of the world’s leading gaming developers. Every game featured here is available at our top-ranked Internet casinos, all of which support secure deposit and withdrawal methods for Australian hi-stakes pokie players. Play with real cash at the sites above to claim huge VIP rewards on hundreds of popular titles from Microgaming, Net Entertainment, BetSoft and more. 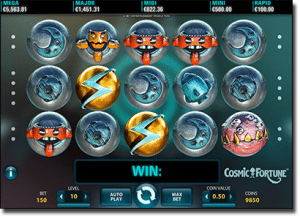 Cosmic Fortune – Most progressive jackpot pokies are pretty light-on when it comes to betting options. Not so with NetEnt’s game-changing Cosmic Fortune real money slot, which lets you stake up to $75 per spin while playing for no less than five jackpots – three of which are progressive. We can’t think of another game which comes with as many bonus features, jackpots and betting options all in one place. Go Bananas – Have some fun in the jungle with this one. Numerous coin options and 10 bet levels give you room to wager anywhere from $0.20 up to $200 per spin, while each of the five monkey-themed wild patterns covers multiple symbol spaces to create some seriously big wins. Jack Hammer 2: Fishy Business – With its comic book graphics and retro appeal, the original Jack Hammer pokie game proved so popular that Net Entertainment decided to give us a second helping. The result is an instant classic which features 99 bet lines, free spins and wilds aplenty, and a maximum wager of AUD $250 per spin. Reel Rush – NetEnt has never been afraid to push the boundaries. The Reel Rush slot game is testament to that ethos, with a unique reel setup and a dreamy Nintendo-like visual theme. Wager as much as $100 each turn and rack up consecutive hits to unlock up to 3125 ways to win on this quirky original release. 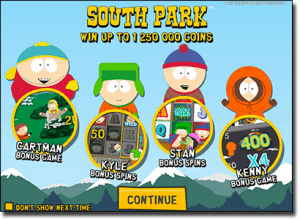 South Park – Comedy Central’s long-running animated series has now spawned two extremely popular Net Entertainment pokies games, both of which take bets upwards of $100. The real VIPs will probably prefer the first edition with its higher $125 bet limit and its multitude of gameplay perks, including four bonus rounds and three wild Mini Features. Microgaming is the oldest and most respected of all the online pokies developers, with a flawless track record that dates back to the birth of Web gambling in the early 1990s. The UK firm has launched thousands of real money slots for desktop download, instant browser play and mobile devices, most of which are accessible to all types of punters. However, these special few offer that little bit extra for the high-limit pokies player. Asian Beauty – Besides being one of the more aesthetically pleasing games on the Aussie casino market, the Asian Beauty online pokie is also a big bettor’s dream. No less than seven coin options allow for a $150 maximum bet, while free spins, bonus games and a 243-ways reel layout combine for an enormous spread of payout opportunities. 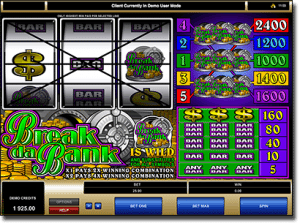 Break da Bank – It looks like a regulation three-reel slot machine at first glance, with five win lines and a very simple pay scheme. But look a little closer and you will see that Break da Bank is actually one of Microgaming’s most generous real money pokies. With wild multipliers and a $125 maximum bet, there’s plenty of incentive for the high rollers here. MegaSpin Break da Break Again – The crowning jewel of the vaunted BdB series is a unique multi-play release which allows you to bet on four separate spins simultaneously. Playing the full nine lines and 10 coins on the Break da Bank MegaSpin pokie gets you a maximum stake of $90. The ‘Slots3’ range by BetSoft is renowned for its breathtaking 3D animations and includes some of the most innovative pokies releases on the Net today. These beauties will offer hours of entertainment and huge potential rewards for those who are willing to put a lot of money down. 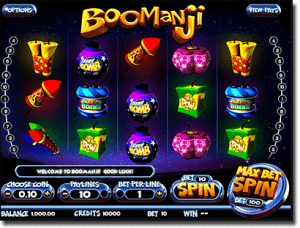 Boomanji – This is one of the more straightforward games in the BetSoft catalogue, with 10 standard paylines which can take up to 10 coins each. However, six different coin sizes (0.02, 0.05, 0.10, 0.25, 0.50 and 1.00) make for very broad betting limits, starting at $0.02 per spin and maxing out at $100. Mega Glam Life – Not unlike NetEnt’s Mega Fortune game, this champagne-soaked progressive pokie revels in the finer things. A $100 bet limit and a three-tier rolling jackpot worth hundreds of thousands of Aussie dollars seem like an appropriate fit for a game which is all about living the VIP lifestyle. SugarPop – There is no real money casino game quite like the SugarPop pokie. A strange 5 x 5 reel display allows you to win multiple times per spin, in any direction, as you progress through different worlds and unlock new Special Candy symbols. Best of all, you can do all this while wagering up to AUD $250 per spin. NYX Gaming has built a very solid reputation with its excellent collection of licensed Internet pokies. Many of these come loaded with special betting features which expand the wagering limits well beyond the norm, which is ideal for hi-stakes slots players. 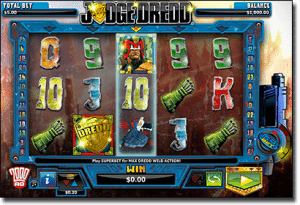 Judge Dredd – Just like the comic series on which it is based, the Judge Dredd online pokies game is fast becoming a cult classic. It’s no surprise that hi-stakes punters all over the globe have taken a liking to this Australian-made video slot, as the unique SuperBet feature pumps the maximum wager up to $200 per spin. Superman – With 50 bet lines, ample coin options and loads of wilds, free spins and scatter symbols, there is very little to dislike about the Superman real cash pokie. But the big draw is the signature Bonus Bet feature, which adds an extra 10 coins per spin and pushes the maximum stake out to a whopping $240. Flash Velocity – Inspired by the popular DC Comics character, the Flash Velocity slot game shares many gameplay features with NYX’s Superman release. Both have 50 win lines, a 4.00 coin option, and a huge $240 stake limit courtesy of the Bonus Bet. The super titles listed above make up just a fraction of the online poker machines available to online players. You can find hundreds more three-reel slots, pub fruities, five-reel video pokies and lucrative progressive jackpot games at any of our trusted casino sites, including dozens of real money mobile pokies for all Android, iOS and Windows Phone devices. New players can even score thousands of dollars in bonus cash just for signing up and making a deposit at secure gaming sites like those recommended in our casino table above. We recommend Bovada Casino as our top-rated casino site for players from United States, which has some excellent welcome bonuses available for new players along with a great range of instant-play casino games.